Robert is trying to figure out what he is doing in Florence and Sienna found out her colleague at the hospital just got shot and the assassin is somewhere behind them - better get moving! The maze of trees should give them some protection - oh no! The police are right behind them and it sounds like they have drones looking for them. Robert and Sienna both pretend they are statues and the Polizia pass by. That was a narrow escape. Robert is still trying to figure out why they are being chased by an assassin and the police. He finds a cylinder in his pocket that he thinks may be what the assassin wants from him. They continue toward Pitti Palace. As the Polizia continue to search for Robert and Sienna, they remain hidden in the grotto and move deeper into the 3rd chamber where they stay hidden until the Polizia have passed by. ......empty of people, but the Corridor is full of paintings that few people are able to see. Of course Robert forgets he is being chased and puts on his professor cap and points out to Sienna the great works of art lining the walls. The corridor is not open to the public (except for a price!) -Look behind you it's a Reubens' selfie! "Really Dr. Langdon, I think we need to go.............."
Robert and Sienna are able to cross the Ponte Vecchio Bridge from above unbeknownst to the assassin and police looking for them below. They still need to find their way into Palazzo Vecchio where there should be a clue as to why the police are chasing them. The magnificent room was enlarged by Giorgio Vasari so that Grand Duke Cosimo I could hold court. .....he and Sienna are able to escape again by climbing the walls of the palace...where will this lead? 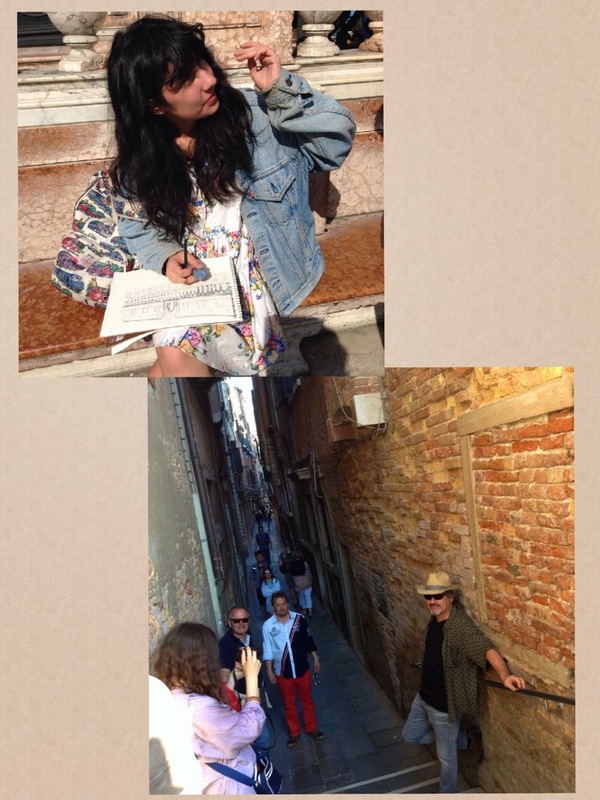 The book is way too long - so we will skip forward and head to Venice where Robert and Sienna find help. Robert and Sienna took a fast train to Venice got there in less than 2 hours and jump on a Vaporetto and head to St Mark's square. The best way to get in to St. Mark's Cathedral is through the side door,... "come on Robert, while the polizia are busy staring at George Cloony's new finance, we should be able to get into the church without notice." When Robert finds Sienna missing - he put two and two together and felt betrayed by her. .... leaves Venice behind him and heads to the airport. Are you wondering what happens next??? .....Well, get the book, because if Dan Brown ever reads this I am in trouble!